The DNA of Success: Know What You Want to Get What You Want - Jack M. Zufelt - Success is not something "out there" - it's an inside job. We all possess what it takes to achieve our greatest desires. But first, to find the motivation and direction our lives lack, we need to pinpoint our Core Desires - those things in life for which we have an intense, unwavering, and deeply felt need. This book smashes the myths of achievement and teaches you to find the cause of success within yourself. Click here for Jack's NEW Video series info! Larry's Review: The inspired wisdom of this book is the "missing piece" in the puzzle of success. Follow it and it will lead you to where you want to go. Practice it and prosperity is certain. For additional information, click here. The Surrendered Wife: A Practical Guide to Finding Intimacy, Passion, and Peace with Your Man - Laura Doyle - Self-proclaimed "feminist and former shrew" Laura Doyle sets forth a whopper of a game plan for establishing profound intimacy in one's marriage. This book will show you how to transform a lonely marriage into a passionate union. Also read: The Surrendered Single: A Practical Guide to Attracting and Marrying the Man Who's Right for You. Larry's Review: This book is the key to reinventing intimacy in marriage. Read it with an open mind. Learn what to say, when to say it and what not say to the man you love and watch what happens! I Need a Man's Pants to Wash - Lorie Kleiner Eckert - A collection of 52 thought-provoking essays ranges far and wide across the landscape of "singlehood," with an addictive blend of heartache and chutzpah. Lorie shares her perspectives on dating, relationships and self-esteem. Larry's Review: A "fun" book for singles. Full of wit, wisdom, heartache and humor, divorce and dating (and more), this easy-to-read book is a must read for the single set. Walking in a Crowd of Angels - Beth Terry - A collection of heartwarming, straight-on observations on life, love, transition and healing. This book gives practical tips for living life with integrity and humor. It's a book even the men will enjoy, and the kind of book you can open to any page and it will hit home. Larry's Review: Beth Terry is a delight to know and her collection of inspired wisdom in "Walking in a Crowd of Angels" is the work of an angel. Her words carefully craft a message of hope, understanding and Love. Available Soon! - 101 Ways to Make Your Life Easier - Beth Terry - Advice from half a century of learning the hard way! Beth does more than jog your memory, she takes it dancing. This rock 'n' roll book is peppered with great advice, interesting life observations and a few whacks on the head. 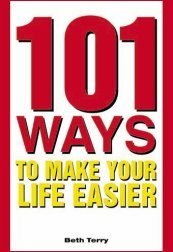 Larry's Review: Beth Terry's wit and wisdom dance on the pages of "101 Ways to Make Your Life Easier." Easier? Hmmmm. Better? Most Certainly! Read it and reap! I love this book!